Captain Britain in Night of the Hawk. | The Captain Britain fans' page and blog. Captain Britain in Night of the Hawk. Welcome back to my look at the early adventures of Captain Britain, when we last saw Cap he and Captain America had just defeated the Red Skull but heroes can never rest. But first the Cap facts. 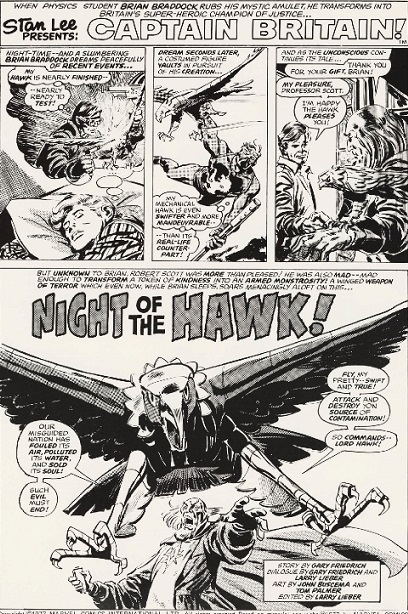 Night of the Hawk came out in Captain Britain issues 27 to 32 published in 1977, it was written by Gary Friedrich and Larry Lieber with John Buscema and Tom Palmer handling the art, but we now return to our regularly scheduled program. Our adventure starts with a blissful Brian Braddock remembering how he helped an old friend of his Professor Scott by building him a fully functional mechanical hawk, keep quiet at the back if you have already guessed where this adventure is going. In a quick flashback we learn the prof has been robbed of his real hawk pets by pollution, hence Cap making him a mechanical one out of the goodness of his heart.The sneaky Prof then takes this harmless toy and recruits an out of work munitions engineer to upgrade it to a destructive level, so armed the Prof begins his crusade too rid Britain of all its sources of pollution but a photo of his hawk in action leads Captain Britain to his door. 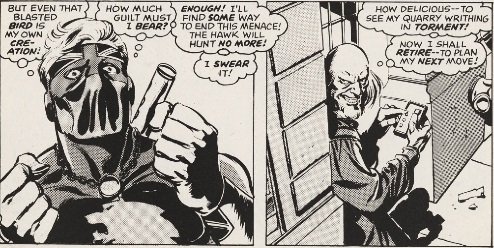 Cap and the hawk face off but by snatching his quarterstaff Cap is defeated, typically with the hero at his mercy the Prof does as all good villains do and refrains from killing him, instead he inserts a homing device into Cap so his hawk can track him down later. Widening his targets for destruction the Prof seeks to destroy Piccadilly Circus , however Cap is on the scene and so faces off again against the hawk. Seemingly unable to defeat the mechanical bird and concerned about the effects of the battle on the innocent bystanders Cap poses for a moment of guilt before the police arrive and he and the hawk flee the scene. 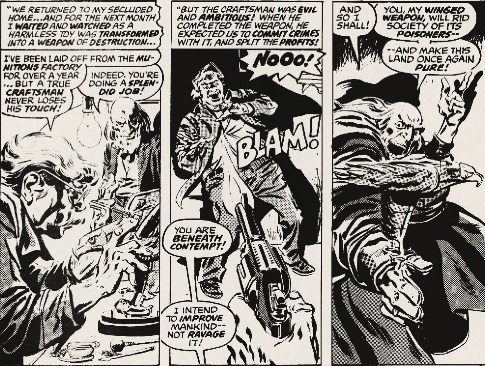 Just a quick interjection here look at how guilty Cap is and how well this comes through in the art just with the look in his eyes and the angst ridden fists, Buscema and Palmer really nail the art in just one small panel. Then in the next shot that evil grin on the Prof’s face is just superb and we are left in no doubt he’s mad, bad and dangerous to know ! 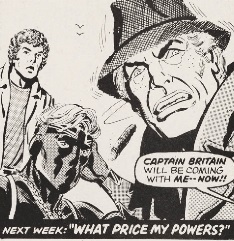 But as Captain Britain lands the law is waiting for him and yet again he is threatened with an unmaksing until a mysterious voice rings out summoning Cap to an unknown fate. These seventies stories are an insane roller coaster of action, angst and then more action, its hard to put across to anyone reading this article that each chapter of Night of the Hawk is only about seven pages long, yet so much happens. Surely the ability to put so much story into so little a space is due to the tight scripting of Friedrich and Lieber but they are helped in no small manner by the art team who use every single panel be it big or small to great effect. Anyway join me again soon for the next Captain Britain seventies story which is a real milestone in his early adventures. This entry was posted in Seventies Captain Britain and tagged gary Friedrich, John Buscema, larry Lieber, Marvel UK, Night of the Hawk by Richard. Bookmark the permalink.